With pink plarn, Ch 4, Sl St to join in first st of chain to form ring. Ch 2 (counts as first Hdc), work 9 Hdc in ring (10 Hdc), join with Sl St at top of Ch 2. Ch 4, *Sk next st, Tr in next st*, repeat between * to end, join with Sl St at top of Ch 4. Ch 4, work a Tr around the complete st between ea Tr of last rnd. (Insert hook from front to back around complete chain in sp between Tr’s). Join with Sl St at top of Ch 4. Ch 4, Tr in ea sp between Tr’s. Join with a Sl St to top of ch 4. Ch 2, Hdc in same st. Hdc in sp, Hdc in Tr st, Hdc in next space, and then Hdc in Tr st. Turn. Repeat to 84 rows or to desired length of strap. Attach to opposite side with a Sl St to match other side. Work Sc from backside across sts to attach strap to holder matching opposite side. FO and weave in end to secure strap to bag. Wow! I am amazed at all of your projects! 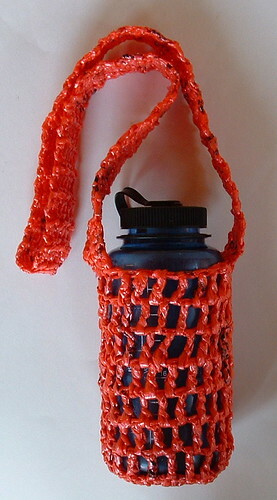 I can’t wait to try out this water bottle holder, I only wish that I could get my hands on some bags of that beautiful color! great to see you on Craft Schooling Sunday! Love this plarn project because it’s a perfect starter project for someone who might be intimidated by the larger ones…thanks so much and all the best!